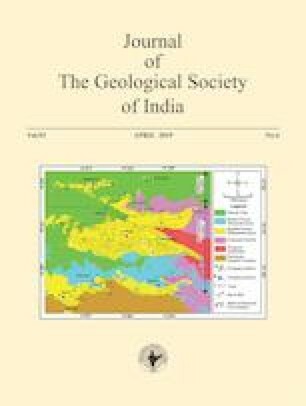 Whole rock geochemical analysis has been carried out on samples from Dhauladhar and Dalhousie granites of the northwestern region of Himalayas. The mineral assemblage of these granites is K-feldspar, plagioclase, and biotite, with Dhauladhar granite being richer in plagioclase and biotite than the Dalhousie granites. The Dhauladhar granites are mostly coarse to medium-grained porphyritic, variably mylonatized and biotite bearing whereas, the Dalhousie granites are fine-grained two-mica granites. The silica-rich (SiO2=64–72 wt %) Dhauladhar granites have a potassic (K2O/Na2O> 0.9–1.8) and peraluminous (A/CNK=1.03–1.3) character. Dalhousie granites show a similar character, albeit to a different degree (SiO2=69–74 wt %), (K2O/Na2O > 1.1–1.5), (A/CNK=1.3–1.7). The Dalhousie granites are richer in, U, Th, and LREE, yet extremely depleted in Sr, Ba, Nb. They have flatter REE patterns with comparatively strong Eu anomaly (Eu/Eu*=0.02–0.04). The Rb/Ba vs Rb/Sr and CaO/Na2O vs Al2O/TiO2 ratios indicate sedimentary source with the psammitic nature for Dhauladhar and pelitic nature for Dalhousie granites. However, the Eu/Eu* value indicates that plagioclase abundance is greater in Dhauladhar granites than in Dalhousie granites. The present study suggests that Dalhousie granites being more evolved than Dahuladhar granites.